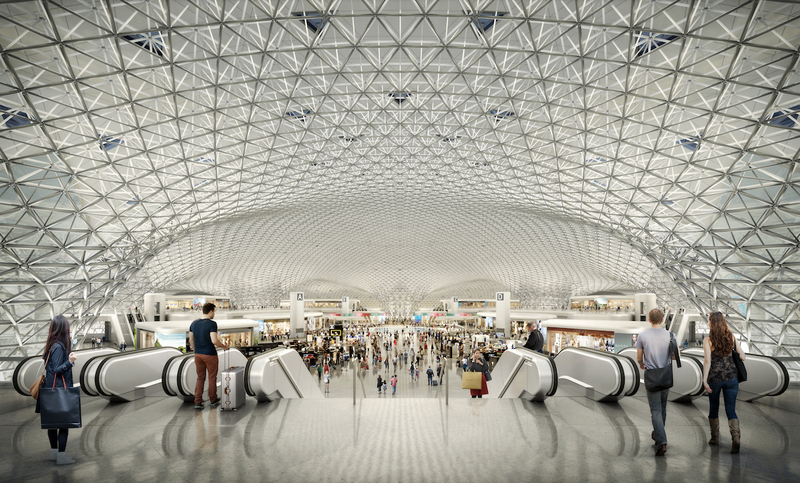 Due to concerns about embodied carbon, the creators of the new Mexico City Airport reduced the use of portland cement and used other measures to cut the building's footprint by 10%. 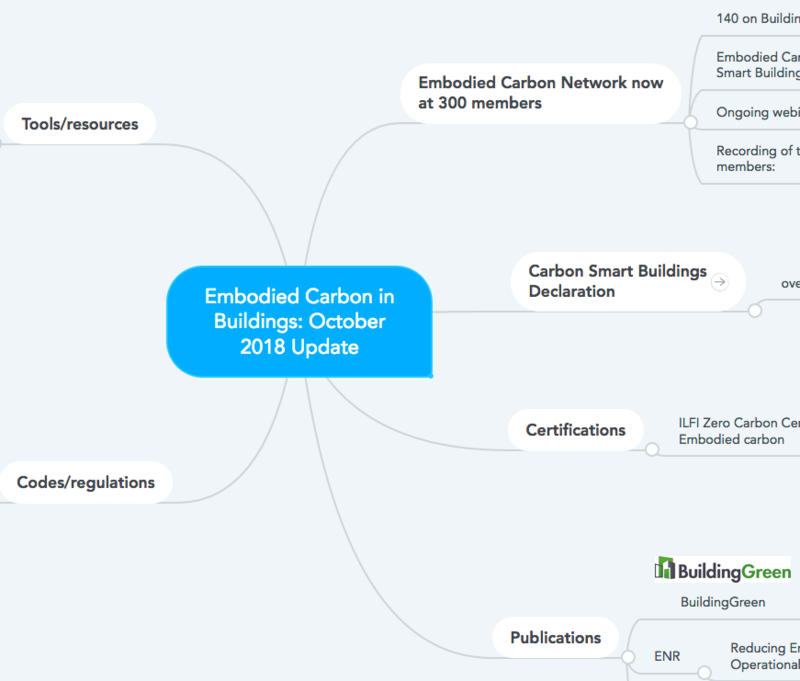 Shortly after the release of Paula Melton’s Spotlight Report on Embodied Carbon, which has been getting amazing reviews and kudos, I sat in on an update by Ryan Zizzo, Chair of the Embodied Carbon Network’s Buildings Taskforce. I was so inspired by the breadth of activities suddenly going on in this space, that I decided to lay them out in a mind map. I was particularly interested in the specifics that are now emerging about how California plans to implement its pioneering “Buy Clean California” law, which requires project teams to solicit Environmental Product Declarations (EPDs) and select lower-carbon products on projects with State funds. When we initially reported on the law, California administrators were handed the daunting task of determining what threshold to set for the allowable carbon footprint of each listed material. Zizzo explained that that projects will begin requesting EPDs in 2019, even though the procurement mandate (the requirement to select lower-carbon products) won’t take effect until 2021. The lead time will allow regulators to simply take the average of the carbon numbers in the EPDs they receive and use that as the threshold for later procurement of lower-carbon products. In other words, the average from EPDs received in 2020 will become the procurement minimum for 2021. Zizzo also noted that the State will require facility-specific EPDs—companies that manufacture in multiple locations will have to generate EPDs specific to each factory. There are few details available yet, but we’re seeing increasing references to an “Embodied Carbon in Construction” tool that’s in the works. The tool’s website doesn’t say much either, but it suggests that they’re working on some pretty sophisticated functionality. And it has an option to sign up as a beta tester. What else are you aware of that’s ramping up as interest in embodied carbon takes off? Let us know by posting below, and we’ll consider adding it to the mind map. There's vastly more going on at North American and in particular at the global level. We're releasing during November a major research piece EMBODIED CARBON REDUCTION – A GLOBAL REVIEW OF REGULATIONS AND RATING SYSTEMS - 100+ approaches for embodied carbon reduction, where we go through pretty much every single embodied carbon addressing regulation, standard, voluntary certification and mandatory guideline there is at the building/infrastructure level anywhere in the world. Total number is 105, and inevitably we've missed a few, but I dare say not many. While it's not available yet, we're publishing it at www.embodiedcarbonreview.com. In the embodied carbon mindmap, would suggest adding One Click LCA to the list of tools www.oneclicklca.com. Works for North America as well as other regions globally. Great to see that there is so much going on in the world of embodied carbon. Also, there are many new building materials that are locking carbon in the wall using biomaterials. We are working on a carbon-negative biocomposite wall system (www.calmura.ca) alongside others in Canada doing structural blocks (www.justbiofiber.ca) and insulating blocks (www.artduchanvre.com). Seems that supply of more environmentally positive materials is also going to be key to improving LCA scores. Thanks, Kelly. Added those to the map. This is a great visual to map everything that's happening in embodied carbon, and extremely similar to the map we drew at the last Carbon Leadership Forum breakout meeting in San Francisco during the GCAS where we tried to relate all of the organizations that are working on embodied carbon and how we can support each other - a crucial piece of this. Green Globes Materials section includes Life Cycle Assessment as part of certification. AIA COTE has written a TopTen Toolkit that includes WBLCA as a best practice. Great Additions to the Mind Map! Thanks for the info and suggestions, Bruce! I split the "Codes/Regulations" branch into "enacted" and "proposed" and added the Marin County code. And your book, of course! The Mind Map is now becoming much more than a record of the Oct 2018 status update; it's moving towards trying to map everything useful going on in this space! What else is missing? 1) Publications. "The New Carbon Architecture/Building to Cool the Climate" was published by many of the leading figures in the field, and it's all about 1) Why embodied carbon matters so much, 2) How to reduce it, and even 3) How to transform buildings into carbon sinks. Thanks for the suggestions, everyone! Andy--we've written about Norway's Powerhouse Standard in the past. Andreé: the Vancouver zoning law is already in the mind-map--awesome to hear that dozens of whole-building LCAs are being generated thanks to that law. The CaGBC standard is a great one to add. Mark--yes, great reminder about the SEI committee work. And Phil, thanks for chiming in on that tool; can't wait to see it go public! We'll get these added to the Mind Map. President for Life , Energy Balance, Inc.
From https://www.smithsonianmag.com/innovation/in-norway-ambitious-new-standa... "To market a building as a Powerhouse, the design must meet a strict definition of energy-positive. It must take into account every stage of the lifecycle, from transport of materials to construction machinery to steel and aluminum production, and even its eventual demolition." Includes operational energy of course but also maintenance and remodeling... Wow! Nice idea, Nadav! There is a lot happening. On the structural engineering side, the SEI Sustainability Committee recently published its book, "Structural Materials and Global Climate," which gives the low-down on the climate impacts of structural materials. We are also working with the Carbon Leadership Forum on developing an SE2050 Commitment for structural engineers, akin to the 2030 Challenge for building energy use, except addressing reductions in embodied carbon, with net zero by 2050. Since most embodied carbon for new construction is usually in the building structure, structural engineers are looking to take a lead in reducing those impacts. CEO , C-Change Labs, Inc.
Yup, we're working hard on it! Skanska is organizing the contractor community, Microsoft is driving the use, and C-Change Labs is doing the coding. It's all about helping you use EPD data to make decisions.